Cute, anthropomorphic, mischievous, terrifying — whatever your opinion of monkeys, you are likely to encounter them in many parts of Southeast Asia. Their antics are enjoyable to watch and make great subjects for social media snaps, assuming that they haven't stolen your camera by then. Monkeys come in many types and sizes, with macaques (Macaca) being one of the most common kinds you are likely to encounter. Orangutans, gibbons, proboscis monkeys, and langurs are also found around the region in more off-the-beaten-path places. 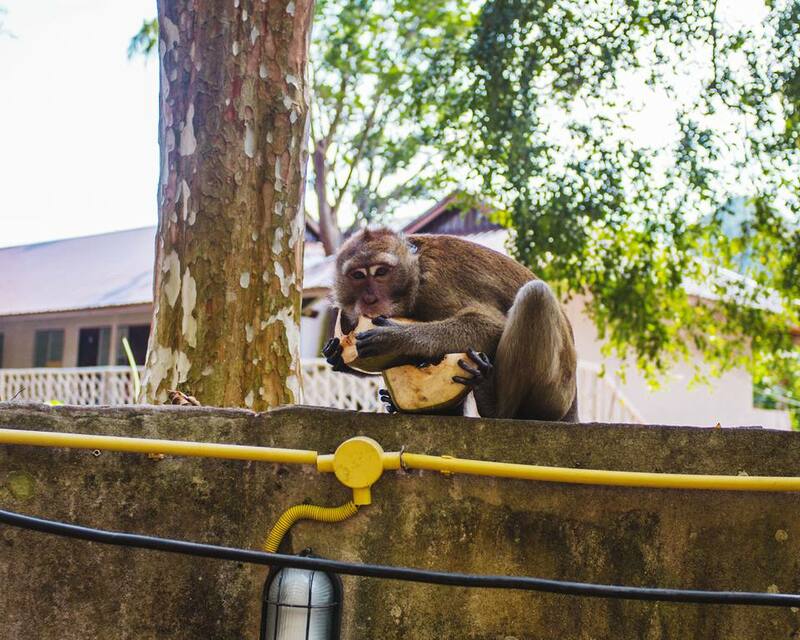 Regardless of how tame and accustomed to tourists monkeys may seem, they should still be approached with caution. These creatures can be devilishly devious, in ways that are not immediately apparent to the untrained eye. Monkeys are extremely curious and may become intrigued by something that you are carrying. A majority of encounters are peaceful, so don't panic if one decides to become friendly. Immediately let go of anything that they grab, or better yet, don't present easy targets such as dangling camera straps in the first place. Monkeys have an impeccable sense of smell and will even detect unopened food. That granola bar in your backpack may seem harmless, but any monkeys in the area will know that it is there. Monkeys may even climb onto your shoulders. If that happens, don't panic and don't reach for the monkey, it will jump off when it is ready. Monkeys may decide to rummage through bags left unattended. More than one tourist has come in from a swim to find the contents of their backpack scattered all over the beach. Yes, monkeys do know how to work zippers. If you see monkeys showing teeth, keep your distance; that's a sign of aggression, not of friendliness. Monkeys are endemic throughout Southeast Asia; large populations of macaques live side-by-side with humans in places like Ubud and Pura Luhur Uluwatu in Bali; the Angkor National Park in Siem Reap, Cambodia; Krabi, Thailand; and the Batu Caves in Malaysia. The macaque overlords of the Ubud Monkey Forest, in particular, are not shy about showing visitors who are boss. Avoid smiling at them. For monkeys, showing teeth is a sign of threat and aggression. A misinterpreted smile may provoke an unnecessary attack. And when a monkey smiles at you, back off immediately. Don't play tug of war. The primary reason that tourists are bitten by monkeys is that they do not drop something that a monkey has grabbed. Camera straps, backpacks, and water bottles are major temptations. Let go as soon as a monkey grabs something, chances are they will examine it and drop it anyway. Don't offer food. Having food around monkeys is a bad idea anyway, but feeding one will attract many more that may take your refusal to feed them as a sign to attack. Don't show fear. Monkey clans usually follow a well-established caste system with larger males being alpha. If a monkey acts particularly aggressive, stand your ground, wave your arms, or pick up a stick if there are any available. If you must retreat, back away slowly while still facing the monkey; running or showing fear will boost their confidence rather than causing them to back down. Be careful taking pictures. A monkey seeing its own reflection in the lens of your SLR camera may trigger an attack. Tourists have been attacked for taking selfies with primates. A monkey bite, no matter how trivial, can quickly turn dangerous. Monkeys are regular carriers of rabies; even the ones not rabid can create dangerous infections and fevers thanks to the high level of bacteria in their mouths. Any bite or scratch requires immediate medical attention.